A free issue of Home Farmer featuring twenty pages of the diverse features which have made the magazine a so popular with readers; gardening to recipes, and livestock to DIY garden projects, Home Farmer is the ideal companion for anyone setting out to enjoy the 'good life', whether you live in the countryside or the city. Home Farmer is a feature-packed magazine led by its editorial, and has been described as being 'like an old friend dropping in.' We have always tried to emphasise the fun element in self-sufficiency as we firmly believe that do it justice and succeed, it should be enjoyed and less like a chore and more akin to a hobby with benefits. 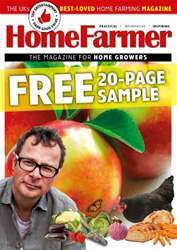 Check out Home Farmer with this free 20-page sampler to see what all the fuss is about!